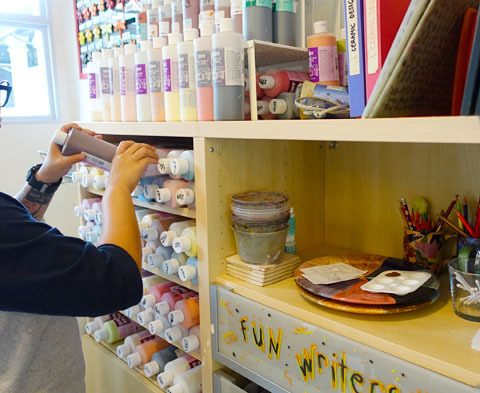 GIVEAWAY: Win one of four sessions to paint your own pottery holiday ornament at Impressions Art Studio! | Beverly's Net: family. food. fashion. 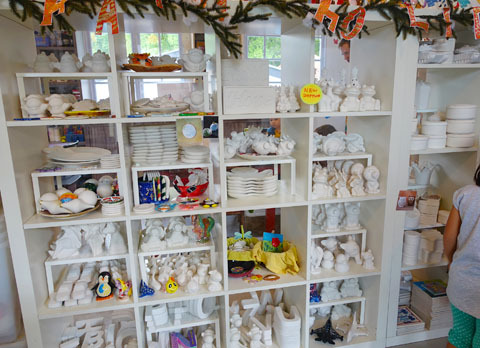 GIVEAWAY: Win one of four sessions to paint your own pottery holiday ornament at Impressions Art Studio! – Beverly's Net: family. food. fashion. 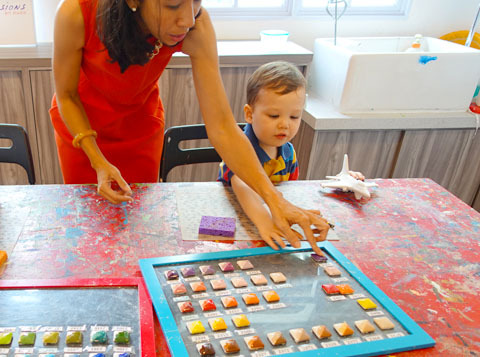 I was really excited at the prospect of my kids going for an art session at Impressions Art Studio – because it was the FIRST time in their entire life they’ve attend a craft class! I suppose it’s never occurred to me to get them to do painting or creative activities, because they’ve never shown much (or any) interest in it at home. Especially Hunter – he refused to hold a pen until very recently, and has absolute ZERO interest in drawing, or colouring in, or anything like that. Both kids are all about vehicles and manipulating objects – physically learning stuff. So I was actually quite surprised that, when I told Hunter “Guess what? We’re going to do PAINTING tomorrow! Not just regular painting, but you can choose something you want and decorate it!”, he was actually really interested and “Really? Oh I’m excited!” were his exact words! So we rocked up to the studio, with me wondering, can a 2 year old and a 3 year old be capable of painting something… and will it be an utter mess and unrecognizable? As it turns out – YES, really young kids with zero interest in crafts CAN and WILL do it… WITH PIZZAZZ! Check out some of the creations that kids at Impressions Art Studio have churned out. Some are actually super impressive. Want your kid to try it out for themselves? 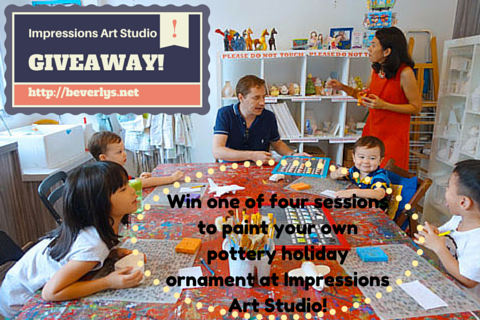 Impressions Art Studio is giving away four sessions to paint your own flat pottery holiday ornament! Be a fan of Impressions Art Studio. Be a fan of Beverly’s Net. Please Like and Share this review. Giveaway will run from 5-14 December 2014 inclusive. Entrants must perform all listed steps, which will be verified prior to contacting the winner. The winner(s) names will be announced on Beverly’s Net Facebook page, where the review is. Each of the 4 winners may select one flat pottery holiday ornament to paint. Prize is all-inclusive of chosen ornament, all paint equipment, and firing/glazing. This is one of three shelves stuffed to the brim with pottery ornaments. There are flat ornaments (ie. very easy to ship to overseas relatives to send them a personal gift from your kid), 3D small ornaments, and big items like serving trays and flower vases. Trust me – you and your child will be there for ages ummmming and aaaahhing over what to select! For my kids, though, it was a bit of a no brainer because they have really specific interests. Hunter immediately zero’d in on the jet plane, though there was also other vehicles and also a monkey that I reckon he’d also be keen on. Carter insisted on the car, but I also thought the giraffe would be super cute for him! Here’s when I thought “Ummm those are just TOTALLY PLAIN WHITE ornaments. Would my kids get excited about it? Would they be old enough to grasp that it would be something much cooler after they’ve painted it?” Well, guess they do, because they were actually really excited, cradling their plain ‘ol ornament… and excitedly jabbering on about what colours it will be! Treated like little adults, the kids got to pick up to 6 colours. 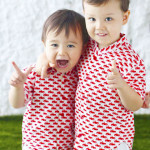 TIP: Young kids (like mine) will just go with all the bright colours they like. I suggest you also add in a dark brown or black to their choices, so they can use that colour for detailing or outlining. 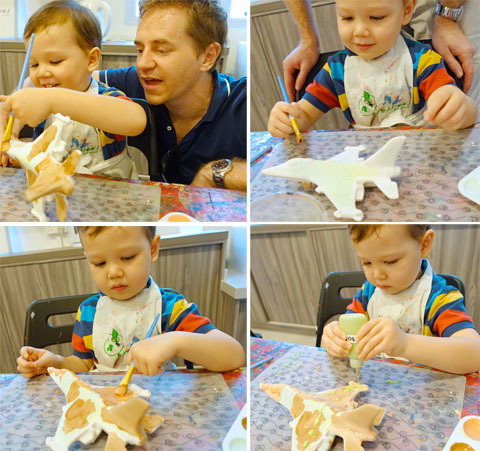 The pottery paints are child-safe, and dry within seconds. They are prepared and squirted into little palettes and placed in front of the kids. Soooo…… wanna see it in action? For Carter, he liked using both the paint brush and the cotton bud. I was actually quite impressed that he could stay (kinda) in the lines… especially with the wheels! Guess it was news to me because we’ve never really done art together (oops). 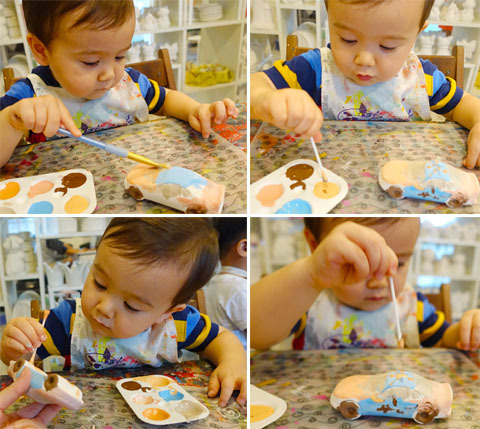 I was also surprised that he could focus on it for almost one hour, painting and decorating his little car. He didn’t get distracted, and just quietly painted and painted! Here he is admiring his freshly-painted car. He could touch it, because the paint dries within seconds. I did help him here and there (mostly to do an extra coat over his, to deepen the colour), and encouraged him on which colours to pick. You’ll also see he has minimal mess on his arms and clothes, because the paint dries so quickly. The paint washed off easily afterwards with plain water. Hunter also surprised me because, prior to this, has always displayed zero interest in art and painting. Actually, only a few months ago he’d have a meltdown if we made him hold a paint brush, because he was so scared of it being “dirty”. But he was WELL into this! 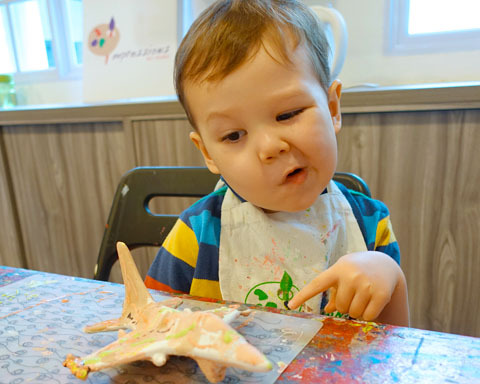 He was wriggling with excitement about painting his own get plane, in the exact colours that he likes (green, orange, brown). I was also really amazed he could paint! Haha! I didn’t realise it was something he could do, since we don’t do art stuff at home, remember. Hunter also had specific ideas of where each colour would go, and the decoration it would have. It’s kind of nice sitting back and watching my 3 year old do something pretty autonomously and seeing his creative self come out. His jet plane! Which, in my opinion, looked like a graffiti plane 😉 The instructor pointed out that it’s an army camouflage plane, which I guess it does too! Hunter was REALLY pleased with it, and kind of in awe with his own…… errrr.. artistic prowess. 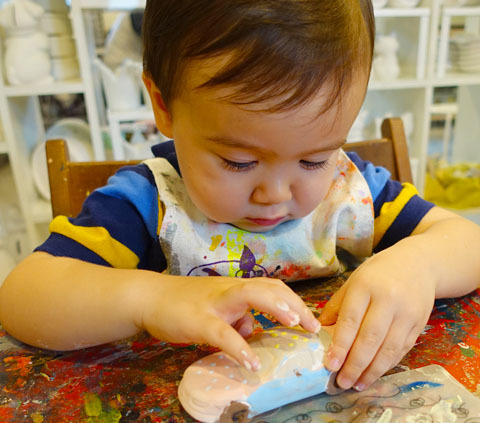 In fact, he still remembers it and the whole art session, and said he really enjoyed himself. If you’re wondering why the ornaments look so washed out, it’s because they haven’t been fired in the kiln yet! They go off to get heated and fired, then glazed. We pick them up in 1-2 weeks time. I CAN’T WAIT TO SEE WHAT THEY’LL LOOK LIKE! A one-on-one treat between your kid and you/spouse/grandparent/loved one. It’s full on undivided attention and time spent together, with something to show for afterwards. Lovely bonding experience. A playdate for your kid and a few friends. Hunter had a lot of fun because one of the girls he likes was there. I think it was 50% enjoyment from company and 50% enjoyment from painting, for him! A present for a grandparent or loved one. Some of the ornaments are flat and/or small, and will ship easily. There is nothing sweeter than a personalized gift! A kids party. It’s not as manic as trying to do your own party, and not as “everyone’s done that” common as a play gym. It’s engaging, fun, and kids get a memento afterwards. Parents that are a bit lazy. This works for me because I just can’t be bothered to go out and get art supplies, set everything up, and clean it all afterwards! Plus, it’s different to standard painting on a paper/canvas. Want to check it out for yourself? GO THIS WEEEKEND! 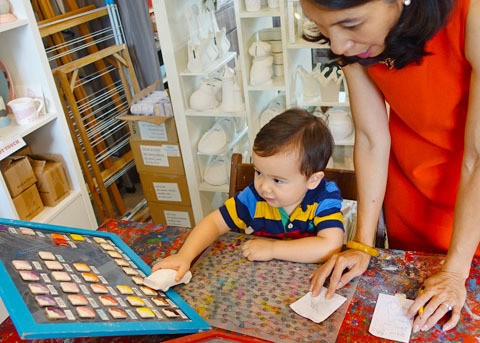 Impressions Art Studio is offering FREE art activities for kids and adults, from 2 to 5 pm on Dec 6 and 7. They are celebrating their spanking new location at Dempsey, so you can go join in on the fun. Oh, and this isn’t a kids-only studio. In fact, heaps of adults go. Girl friends go together for something a bit different, and couples go there on dates to get creative together. Whilst we were there, there was a guy and his girlfriend painting matching owls – cute! Thanks for all the fun, Impressions Art Studio! 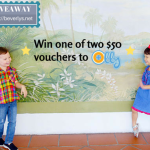 GIVEAWAY: Win one of two $50 vouchers to Olly (plus 20% off storewide)!